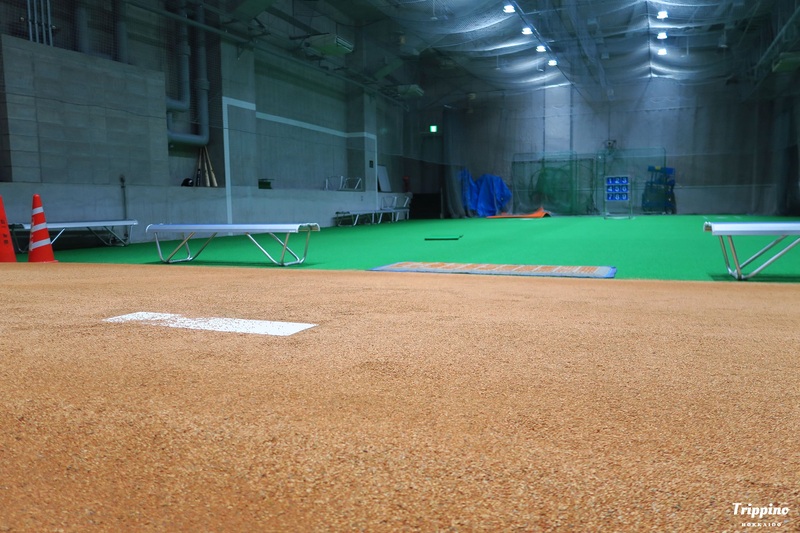 Behind the Scenes at Sapporo Dome | Trippino HOKKAIDO - Discover cool things! Are you a fan of watching sports? 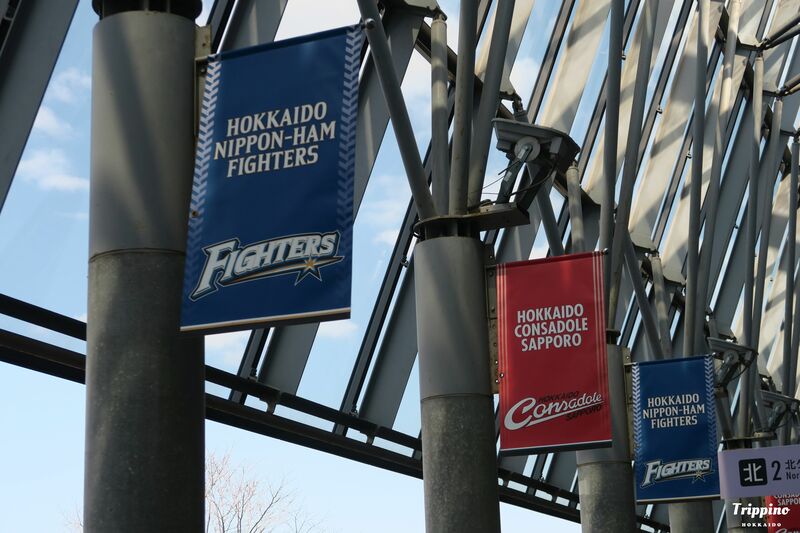 If so, you might want to drop by Sapporo Dome when you’re in town. 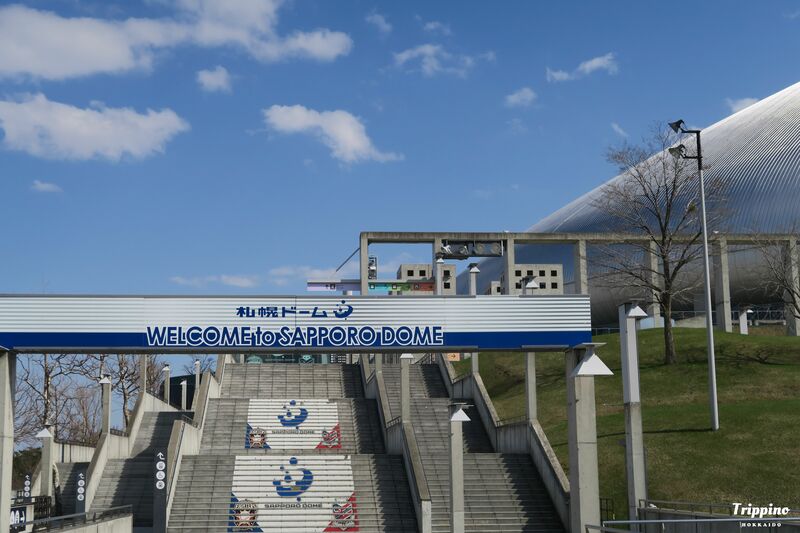 Sapporo Dome is home to two professional sports teams, the Hokkaido Nippon Ham Fighters baseball team, and the Consadole J-League Soccer team. 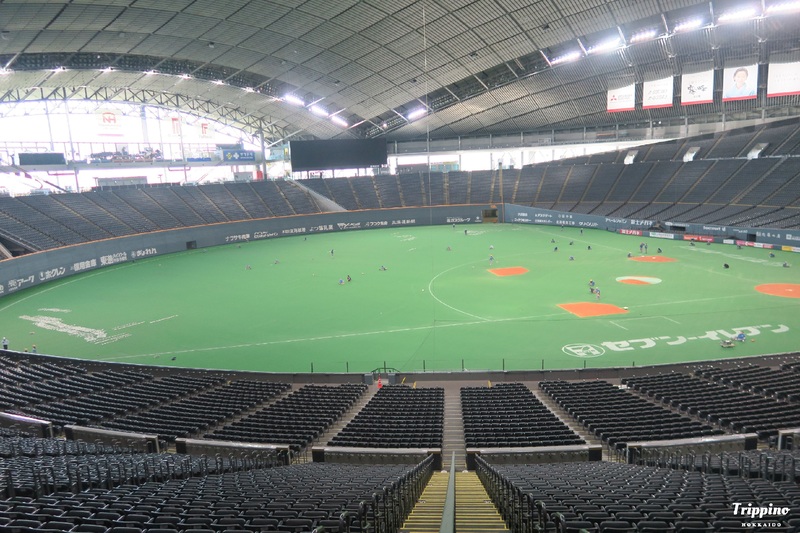 If sports aren’t your fancy, Sapporo Dome also hosts a variety events, such as concerts, motor shows, marathons, and even has a fitness room for the general public. Of course, sometimes your schedule may not match, or you’re in town when its not play season. Not to worry, on days where there aren’t events or games, there are dome tours giving you exclusive access to areas normally not open to the public. Whether you’re a sports fan wanting to get a peak at lockers rooms or dropping by Hitsujigaoka next door, here’s a great way to marvel this feat of architecture. 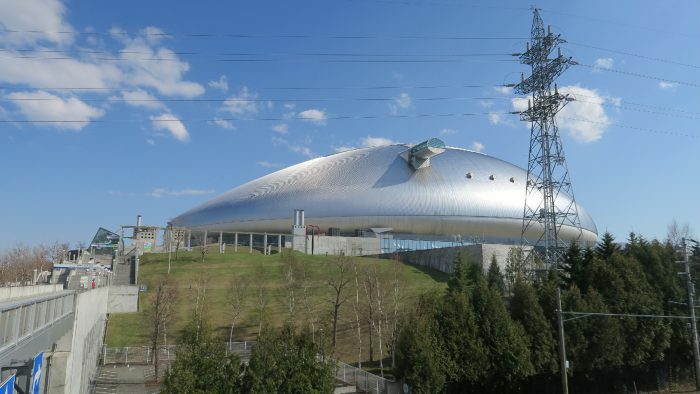 Opened in 2001, the Sapporo Dome was constructed for the 2002 FIFA World cup and is the first stadium to have a “floating soccer field”, which helps it transform between a baseball field, soccer field, and event space within half a day. When switching from baseball to soccer, the turf of the field is rolled up and the rear stands retract to reveal the soccer field sitting outside. Weighing 8,300 tons, the field is lifted up with air similar to how hovercrafts work, to reduce its weight by 90 percent, in which it is then rolled into the stadium. For non-sports events, the ground concrete floor of the stadium has been home to numerous concerts as well. Famous artists like Bon Jovi, Aerosmith, Mr. Children, EXILE, AKB48 and BIGBANG have performed here. Taking advantage of the spring weather, I decided to check out the dome tour to see what it’s like. While I cycled the dome to take in some sunshine, access to the dome is quite convenient, just a 10-minute walk from Fukuzumi Station on the subway Toho Line. My ride took around 45 minutes from Sapporo Station and when I arrived there weren’t a lot of people since there was no event. Sure enough, after buying my ticket and waiting for the tour to begin, I was the only one there. Private tour, lucky me! We started off walking through the stands and getting a view inside. As we walked behind the plate, we had a chance to experience the premium seats and a peak into the box seats. 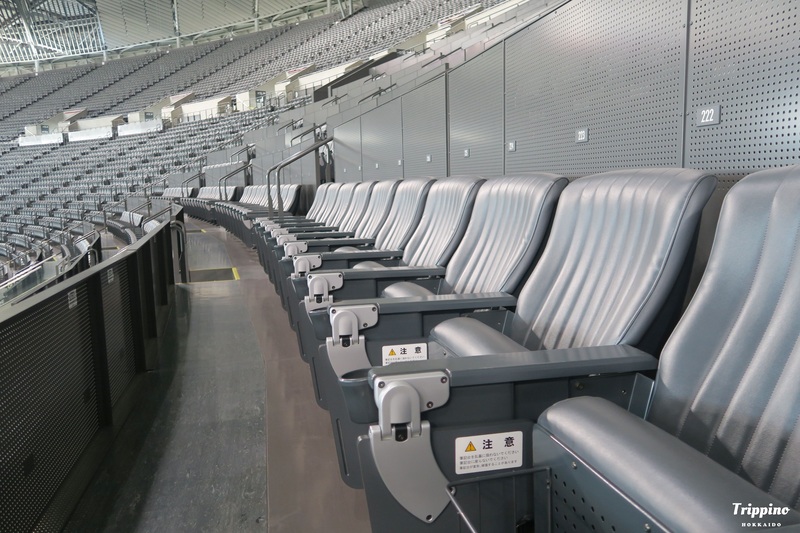 Different from other stadiums, the press area in Sapporo Dome is located right next to spectators’ stands, so if you get a seat nearby you’ll get some exclusive commentary to go as well! 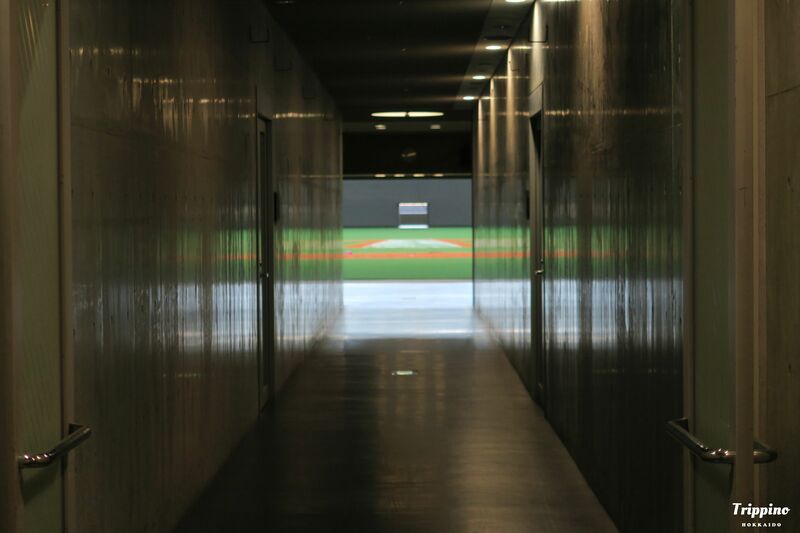 Heading downward, we got to get right up to the field at the dugout, where players sit awaiting their turn. 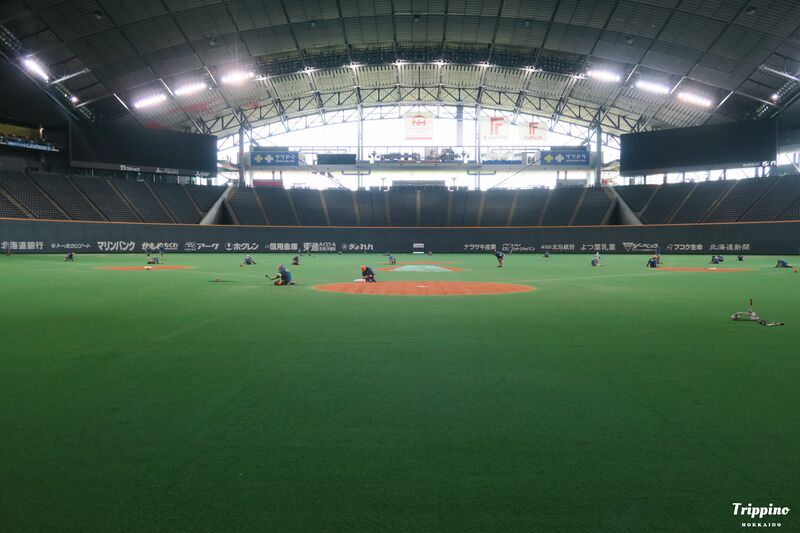 On that day there or 30 or so workers on the field hammering and preparing the field. 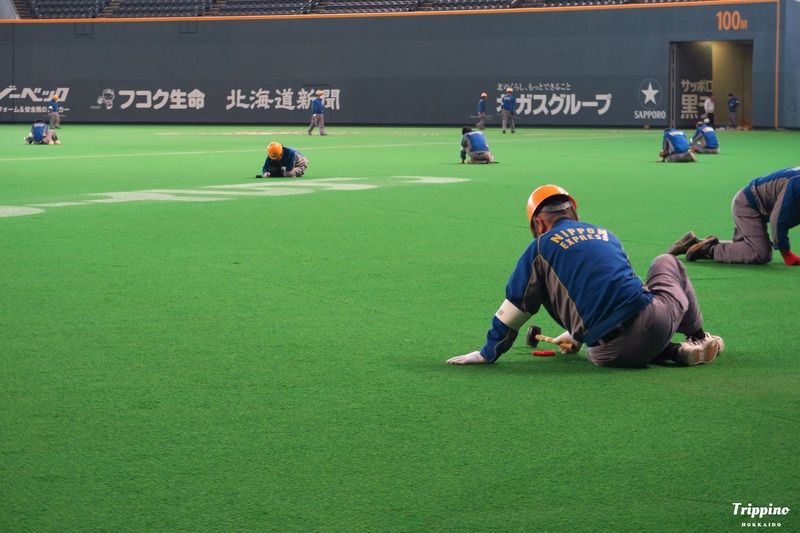 Curious what they were doing, the guide explained that since the baseball field is prepared in strips, the small gap between each strip needs to be hammered down and made flat by hand to ensure optimal playing conditions for players. Talk about attention to detail! After giving up on my dreams of being a baseball player, we checked out the locker rooms which were more normal than I thought. 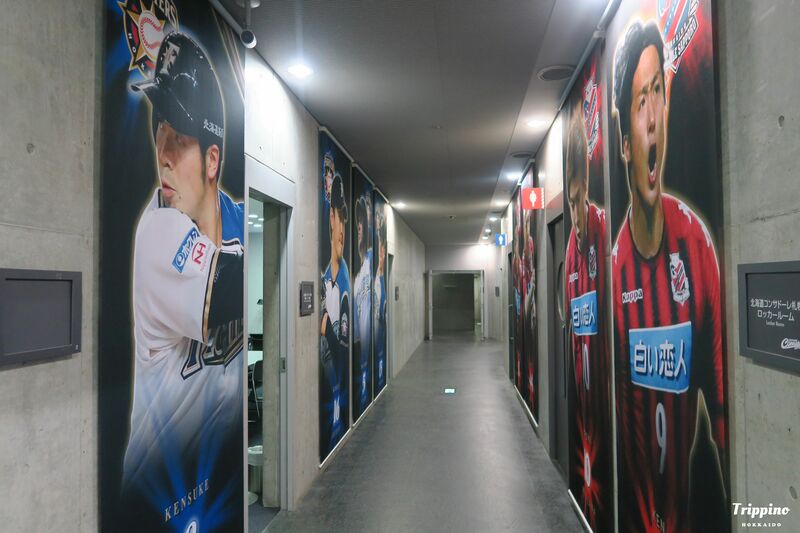 Yet walking down the hallway, there’s a real sense of occasion as posters of both Ham Fighters and Consadole players line the walls and that superstars like Shohei Ohtani had walked the very same halls. The tour took about an hour and was definitely time well spent. While I personally am not the biggest fan of watching sports, it was interesting visiting the same areas top class athletes use and made me want to check out the next game. Depending on when you visit, the contents of tour may change, and during play season if you happen join the right tour, you might get a chance to see players practice during the mornings, and maybe get a photo! Sometimes during events like the relay marathon in July, participants have a chance to be the center of the show, starting and ending at the dome for an experience that is normally limited to the pros. In the upcoming years, the dome will be hosting some major events, such as matches of the 2019 World Rugby Cup, soccer games for the 2020 Summer Olympics, and if all goes well, the Winter Olympics in 2026. Who knows, maybe you’ll be showing up at the dome sometime soon! 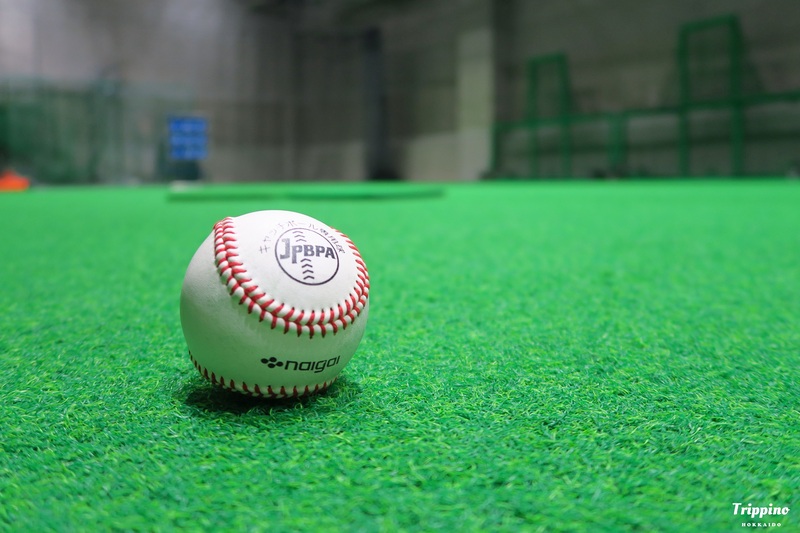 If you haven’t experienced sports games in Japan, it is definitely worth checking out as cheering on the teams is an event itself, but don’t miss out on a special chance to check out what behind the scenes!